We've always been curious how ARM's stock graphic processing units of the Mali family stack up against the PowerVR GPUs that Apple utilizes, but that interest peaked now that we have the next generation Mali-T604 in the Nexus 10, and a quad-core PowerVR SGX544MP4 in the iPad 4. These, along with Qualcomm's Adreno 320, are the fastest mobile graphics processors around, so it is very interesting to see how they stack up. The Nexus 10 tablet was on top by a large margin before the new iPad in only one test, but probably the most important one, as far as raw GPU power is concerned - the offscreen Egypt HD benchmark, as in the rest it has to push 25% more pixels as well. When it comes to the iPad 4, however, it seems that the quad-core PowerVR GPU is leaps and bounds ahead everything else, and exactly what was needed for superior gaming performance on the high-res display. The Cortex-A15 processor also did very well in browser tests, taking the lead in Google's own Octane browsing test, as well as in Mozilla's Kraken, but fared lower than the iPhone 5 in BrowserMark and SunSpider - the iPad 4 was not included in the browsing tests. Overall, our thoughts and hopes on Cortex-A15 have been met, and we can't wait to grab one retail Nexus 10 and put it through its standard benchmarking paces. This is freaking insane,considering the price. I watched some Nexus 10 reviews and saw lags and the performance was not as smooth as Nexus 7. May be this was only the preproduction prototypes and Google and SS will improve the final products. they dont have the retail version yet...in some videos they even say its not the final version. That's why they have offscreen tests at 1080p to level it out, and the sgx554mp4 still has around twice the FPS. Ahahaha I know right. The Lakers won't make the playoffs after losing all those preseason games, just as the Nexus 10 didn't perform well in _preliminary_ tests. "Trailing behind the iPad 4" ... The headline should be more along the lines of: "iPad 4 completely blows the Nexus 10 out of water in preliminary benchmarks"
GPU benchmarks Speaking of SoC, A15 blows the A6X out of the water.. Just wait for the first Geekgbench results! They are in, and the CPU and GPU in the A6 and A6X are superior to the 5250. Try again. What are you throbbing about? Here's an iPad 4 geekbench result: http://www.primatelabs.com/blog/2012/10/early-ipad-4th-generation-benchmarks/?utm_source=feedburner&utm_medium=feed&utm_campaign=Feed%3A+primatelabsblog+%28Primate+Labs+Blog%29 Even the Galaxy s3 is better than that! Not really. It's because the A15 is clocked @ 1.70 GHz , while A6x is clocked @ 1.39 GHz. I am sure if if Apple clocks the A6x at 1.7, it would most likely achieve a higher than that. Not really. Check the stats for both. Average score for A15 is 2350. With 1.7ghz apple should go to about 2050 but that's it. Phonearena, please make an article about this benchmark too.. we are seeing a great leap in mobile computing. Think about it, this cheap Exynos having more than double the power of once almighty Power Mac G5 pc tower! Exynos 5's a15 is around 25% faster than iPad4's swift cores and the iPad4's GPU is 60% faster than the Mali t604. Geekbench of 1757 vs 2300, GPU scores are 42 FPS vs 25 FPS. Choice is yours but a meaty GPU is better for games and the slightly faster CPU is better for web browsing and email but you'll only be able to do that when you're connected to Wi-Fi since there is no cellular version of the Nexus 10 anyway. Or a 64GB version and no tablet apps, Especially any apps at 2560 x 1600. Is the T604 a quadcore or a dualcore? same as Adreno320vs Pvrsgx quadcore. A bit unfair comparison? Quad core, Dual core, don't pay attention to any of that unless you know the difference in the architectures, what you really need to do is check out the benchmarks. For a CPU example: a quad core cortex A9 as in the Tegra 3 is slower than a dual core cortex A15 as in the exynos 5. A GPU example: the dual core SGX543MP2 in the iPad mini is faster than the 12 core GPU in the Tegra 3. So just check out the benchmarks when you want to compare SOC's. Geekbench for cross platform CPU benching and GLBenchmark for cross-platform GPU benching. 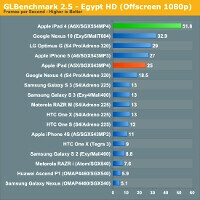 Apple A6 wins in most of those benchmarks. Here comes the fandroids hate posts! /popcorn ...dis gunna be good. Too bad it doesn't take much to run an app drawer that hasn't been changed since 2007. They sure r. If u think about it How can u go wrong either way.